I first came across Esther al-Tanani when I was conducting research into discourses about marriage in Cairo’s Karaite Jewish community in the 1940s. As Hanan Kholoussy demonstrates in her book For Better, For Worse: The Marriage Crisis That Made Modern Egypt, marriage was a topic of immense concern to Egyptians in the early decades of the twentieth century. 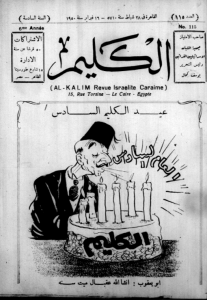 Egyptian commentators agonised over who, when and why young Egyptian men were marrying, and as Kholoussy shows, this functioned as a vehicle for anxieties about the wellbeing of the nation during a time of political upheaval. My impression, based on preliminary research, is that it took these ideas some time to filter into the Karaite community. But I’d hate to suggest the Karaites were behind the times in any way, and the matter definitely needs further research. What is certain is that during the 1940s, Karaites in Egypt were concerned about marriage, and specifically the practice of dowry payments—dota in Arabic—which was specific to their community. Many felt that the sums involved had become overly inflated and were skewing young men’s choices, making marriage a sort of commerce which was demeaning and dehumanising to women, and damaging to the integrity of the community. Most obviously it meant that poor women struggled to marry, but it also meant, in the eyes of some, that matches were not being made on the basis of, say, good character, compatibility, love or sound reputation, but on the basis of wealth and greed.